Chill milk instantly to 4o C, within seconds! Promethean’s Rapid Milk Chiller is a modular milk chilling system that instantly cools milk from 35o to 4o C without a diesel generator. The system can chill 1000 litres of milk per day, even if there is no power during the milk collection by using only 4 hours of intermittent grid power between each milking shift. The Rapid Milk Chiller is ideal in situations where there is a long gap between the milking by the farmers and the milk reaching the collection centre. By eliminating a Diesel Generator set, Promethean Milk Chiller provides the most cost effective way of collecting top quality chilled milk from village milk collection centers where grid power is erratic. Crash cooling arrests bacteria growth instantly. Premium quality enables longer shelf life of processed milkand higher margins on value-added products. Thin film on the surface cooler de-aerates the milk. Works with single phase connection at village collection centers. Milk collection is a huge logistical challenge in Bangladesh, due to the remoteness of the villages and the road conditions. Farmers milk the cows early in the morning and get the milk to the collection centre; which may be between 5 and 20 kms away. The time taken from milking to delivery to the collection centre is between 1 ½ to 2 hours. This milk is then taken to the chilling centres with transit times between 5 to 6 hours. The total time from when the farmer milks the cow to the milk reaches the chilling centre can be as high as 7 to 8 hours. Lack of serviceable roads makes it difficult for milk tankers to operate in these villages. Due to this Bulk Milk Chillers which both store and chill the milk cannot be installed. This leads to a high rate of spoilage and between 6 to 7 % of the total milk collected in wasted. BRAC wanted a solution which could reduce the spoilage by rapidly chilling the milk delivered by the farmer to the collection centre. The solution also needed to be cost effective, eco-friendly and sustainable to roll out over a large number of villages. 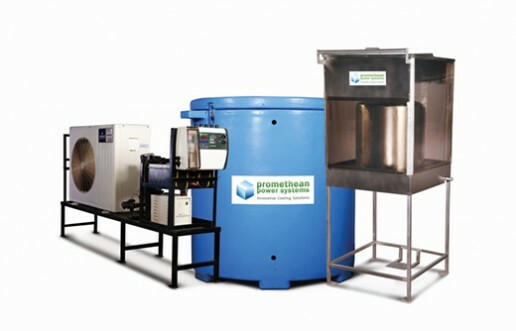 BRAC identified Promethean’s Rapid Milk Chiller as the solution which would meet all their requirements. The Rapid Milk Chiller based on the Thermal Energy Storage technology is able to bring down the temperature of milk from 35o to 4o C within seconds. The Thermal Storage is charged using the intermittent grid supply whenever it is available. It discharges to generate the cold energy required to chill the milk. The chilling is not dependent on the grid availability and is highly cost efficient and eco-friendly as it eliminates the use of a Diesel Generator. Post installation of Promethean’s Rapid Milk Chillers in their village collection centres BRAC has been able to reduce the milk spoilage by over 90% and it has also increased the confidence of the farmers in the village leading to a increase of 60% in the volume of milk collected.